Dion (fr Gr Ζεύς, gen, Διός) means a holy, sanctified site Dion, in Macedo­nia, occupies a very narrow stnp of land between Mount Olympus foot and the Thermalhos Sea. The Olympian Zeus temenos, the main sanctuary of all Macedonians In antiquity was located there. 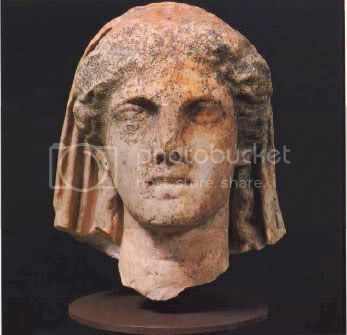 Its history is related to the royal names ot Macedonia, such as Archelaos, Philipos II, Alexander. 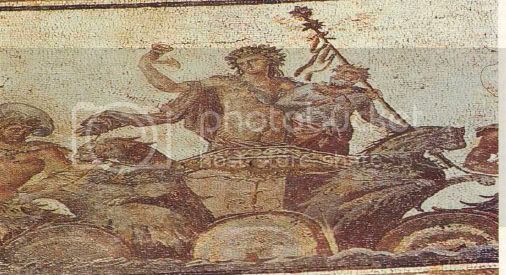 Cassandros, Philipos V and Perseus. 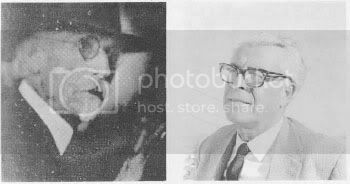 In 1928 G Soteriadis, Professor and Lector, at that time, of the University ol Thessaioniki started excavating the site. The excavation was carried on un­til 1931 and brought to light a number of Hellenistic and Roman buildings Most important among them was a vaulted Macedonian tomb with a Doric facade, an Ionian anteroom and a spacious funerary chamber with a large marble bed. A second phase of excava­tions started In 1963 and lasted, with a tew Intervals, until 1972. During this phase, which was realized due to Pro­fessor G. Bakalakis. Initiative, the south part ot the fortification wall as well as the Roman theater have been research­ed. Since 1973 the excavation has been supervised by Professor D. Pandermalis. The steadily progressing works had as a primary objective the research of the sanctuaries and then that of tha town and cemetery. The feast of Olympian Zeus in Dion was the most venerated event In the religious life of ancient Macedonians The festive activities were lasting for nine days and, besides sacrifices, theatrical and athletic competitions were also included. In the temple of Olympian Zeus the statues of the Macedonian kings were in display as well as the stelae Inscribed with Impor­tant official texts, such as treaties of alliance, definition of borders, honorary decrees. Demeter, the goddess ol earth fertility, was also venerated in Dion as in most of the Greek sanctuaries. Demeter’s temple was discovered in 1973 a few meters away from the town walls ot Dion. The older edifices are Iwo small lemples of the sixth century BC, that were replaced by bigger ones in the early Hellenistic period. The meticulous research through the layers of destruc­tion produced a late fourth century BC marble head of the goddess, a number of sculpture, an abundance of clay idols, pottery, coins and jewels. The sanctuary was repaired in the Roman penod and its life lasted until the fourth century AD. To the east ot Demeter’s temple was discovered in 1978 a temenos dedi­cated to the cult of the Egyptian gods Sarapis, Isis and Anubis were worship­ped there, but mainly Isis Lochia, tha goddess who was taking care of women during the critical period after childbirth. The central temple of the sanctuary was dedicated to her. However, from inscriptional and other sources we draw the conclusion that another goddess of childbirth has originally been worshipped here, the goddess Artemis Eileithyia, who in the Hellenistic period has been succeeded by Isis Lochia. 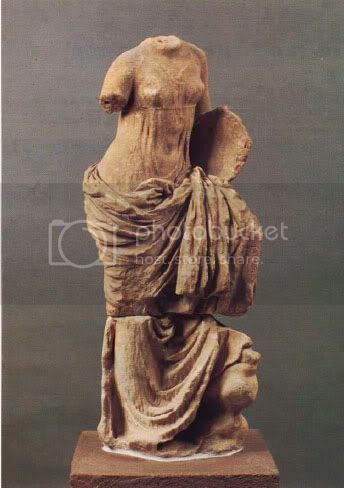 Another temple was dedicated lo Isis as goddess of Luck, while a third to Aphrodite Hypolympidia (=Aphrodite worshipped at the foot of Mount Olympos); a charming cult statue of this goddess, dating from the second century BC, has been discove­red during the excavations. The theater of Dion is located at the area of the sanctuaries outside the town walls. It has been constructed by accumulating large quantities of earth in the years of Philipos V; its seats are made of big Hellenistic bricks. The theater displays a spacious orchestra and a coelon so designed as to ac­comodate a large number of people, since it was the theater not of a local, but of an important, famous sanctuary. A strong wall over 2,600 m. long, built in the years of Cassandros, was protec­ting the town. The fortification was fur­ther reinforced by a number of lowers standing 33 m. from each other. This wall was once repaired in the Hellenistic period and was rebuilt in the second half of the third century AD, when fierce barbaric raids had to be repelled. In the fourth century AD a new, but mediocre, wall was built around the Early Christian settlement, a small, faded reminiscence of the an­cient town. 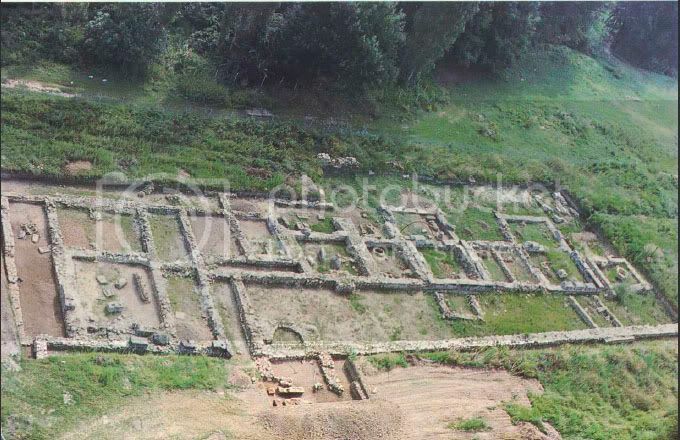 The public baths, excavated in the south sector of the town, is an impressive group of buildings of 200 AD: Shops and workshops, public lava­tories, a court for gymnastics, a small roofed theater ( = odeum), bathing areas, recreation rooms and a chamber dedicated to the cult of Asclepius. A unique group of sculptures represen­ting Asclepius’ whole family has been found in it. A large villa with a roomy bath, two atriums, a spacious banquet hall, a series of shops etc, is under excavation to the east of the town. The villa has been endowned with a wonderful mosaic pavement showing the trium­phal epiphany of Dionysus. This central theme is framed by six smaller panels decorated with theatrical masks. Four statues of philosophers have been discoverd in the same room, while in another, smaller one with a niche, the statue of the venerated god Dionysus. The cemetery of Dion lies, mainly, to the north and east. Its funerary monuments date from the fifth century BC to the fifth century AD. Most impor­tant among them are the vaulted Macedonian tombs and most eminent of all the one with the Doric facade, the Ionian anteroom and the largo funeral chamber with the decorated marble bed. Since 1980 are excavated to the west of Dion tymboi ol the Early Iron Age (1000-700 BC). They usually contain box-shaped graves, whose funeral offerings is, mainly, pottery. The women’s jewelry is made of copper, rarely of gold and semi-precious stones like sard. The pottery is closely related to that of Thessaly. cementery – and is now excavated. In the stoa outside its narthex a marble, built trapeza has been found; its relation to an adjacent cenotaph probably sug­gests the worship of a Christian martyr. Dion seems to become abandoned dur­ing the fifth century AD due to a succes­sion of natural disasters (earthquakes, flood). Since then its inhabitants found shelter on safer locations at the foot of Mount Olympos, where new settlements were built. Source: Greek Magazine “Archaiologia”, Dec. 1989.